Happy Halloween! As you may have noticed, I didn’t have to do a lot of sewing for Halloween this year. So I decided that I needed to sew some Halloween “themed” things instead! First up, a shirt for Easton to wear today at school. This is yet another Nico (I have lost count how many I’ve made so far), stashed white jersey, and a skeleton Doodle fabric from Joann’s. As much as I complain about the Doodle line of fabric (they have great designs, but the fabric generally has poor recovery and stretches out of shape easily) this one isn’t bad and sewed up nicely. This entry was posted in Uncategorized on October 31, 2017 by stacy. 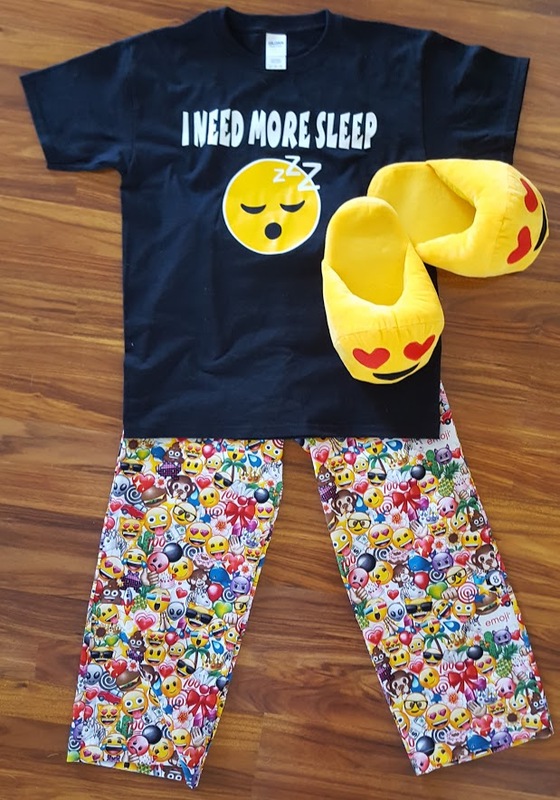 Last week I showed off a shirt that I had made for Easton’s Red Ribbon Week at school, but because I had to do these very last minute, I never showed off the finished pajama pants…. So here they are this week! Once again I used Peek-a-boo Pattern’s freebie, the Pajama Party Pants. I paired this up with an emoji print from Joann’s – if you really like these, ignore the fact that it says online only… I found it in my store so it’s worth giving yours a try. I can’t say too much more about this pattern that hasn’t already been said in previous versions, but once again, the pants sewed up quickly and the fit is great. This may be his favorite pair so far – he even had slippers to match! This entry was posted in Uncategorized on October 30, 2017 by stacy. Somehow, I got so busy on Wednesday that I forgot to blog. How does that happen? What I wanted to share with you is my latest project for Creative Machine Embroidery magazine November\December 2017 issue): Gift Card Holders that double as ornaments (or tags). 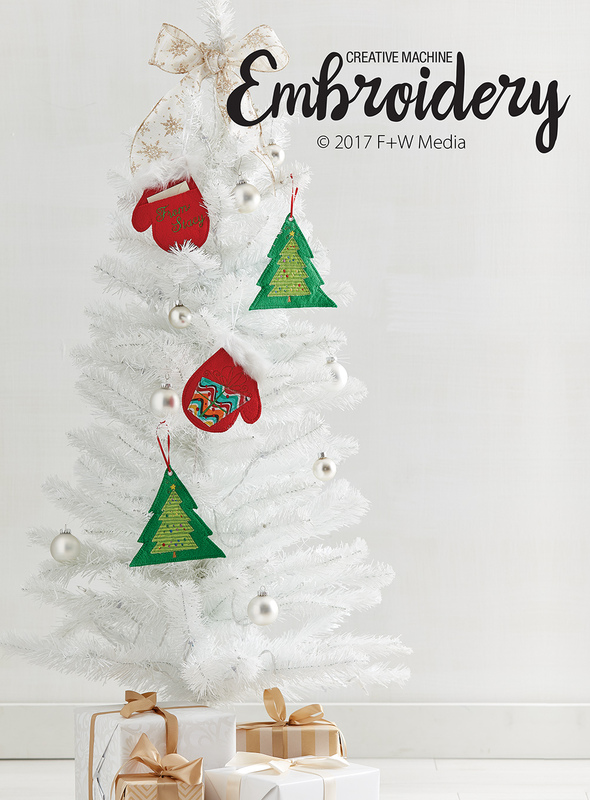 You can grab your free templates to make this project until December 31, so there’s lots of time to whip these up for the holidays. In fact, they’re so easy to make you can sew up a handful in no time. No embroidery machine? No problem! The templates are designed to be cut by hand (only the embellishments are sewn with embroidery) so they can easily be finished on any type of machine. Be sure to grab you copy now! This entry was posted in Uncategorized on October 27, 2017 by stacy. If you’re needing a new bag for work or school, this Relaxed Shoulder Bag has tech pockets and handles too! I wish some of these Halloween costume tutorials didn’t come out so late… because I love this Circus Clown and Bear Piggyback idea. Maybe next year. The holidays are rapidly approaching and if you’re looking for a hostess gift to give, look no further than this pretty half apron. Have jeans that no longer fit? Upcycle the pockets into a cute Advent Calendar! 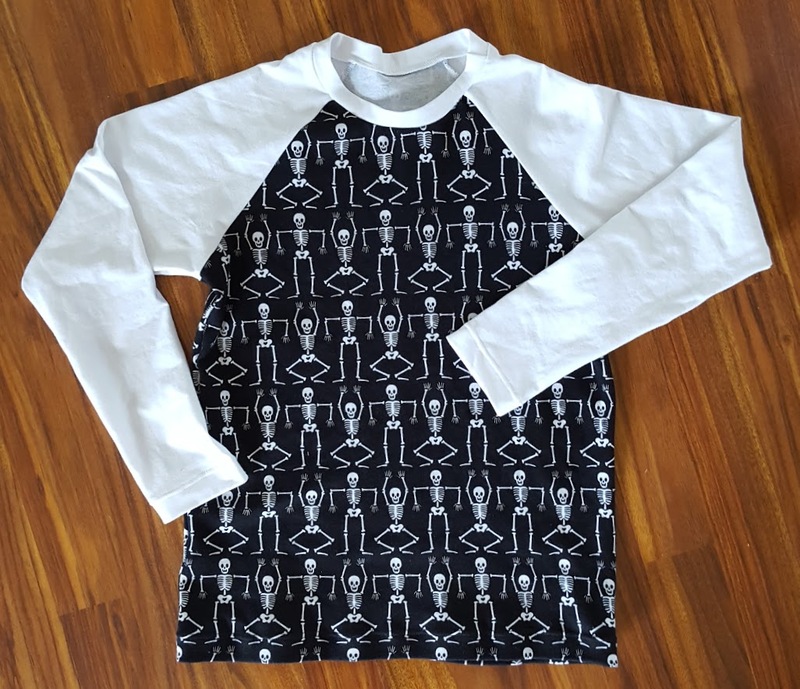 This one can be no sew, too! I usually see these reusable bowl covers in the summer, but they would be great for holiday potlucks too – just change up the fabric. This cute little bag is labeled for shopping, but could be used for just about anything. Capes are a fast way to bring life to a costume. This Bat Cape is perfect – especially if you’re channeling the Adam West Batman this year. If your little girl loves skirts, but your temperatures are dropping, you’ll love this Legging\Skirt pattern combo. Say goodbye to yoga pants and hello to joggers. Learn how to transform your pants into the latest athleisure fashion trend. Much of WobiSobi’s shirt tutorials are no sew, but they always have interesting details. Like her latest project the Weaved Back Tank. Perfect for fall decorating, an easy (just 15 minutes!) Monogram Pumpkin. This entry was posted in Uncategorized on October 26, 2017 by stacy. This week is Red Ribbon week, which means that every day has a theme. Coming up? Pajama day. I realized that we really didn’t have a lot of pajamas that fit any more (aside from the Jingle All the Way set that I just made, but it seems a bit early for Christmas), so I decided to make some. This year’s reading theme is emoji’s so I thought it might be fun to do a pair in some fabric that I had stumbled across at Joann’s. 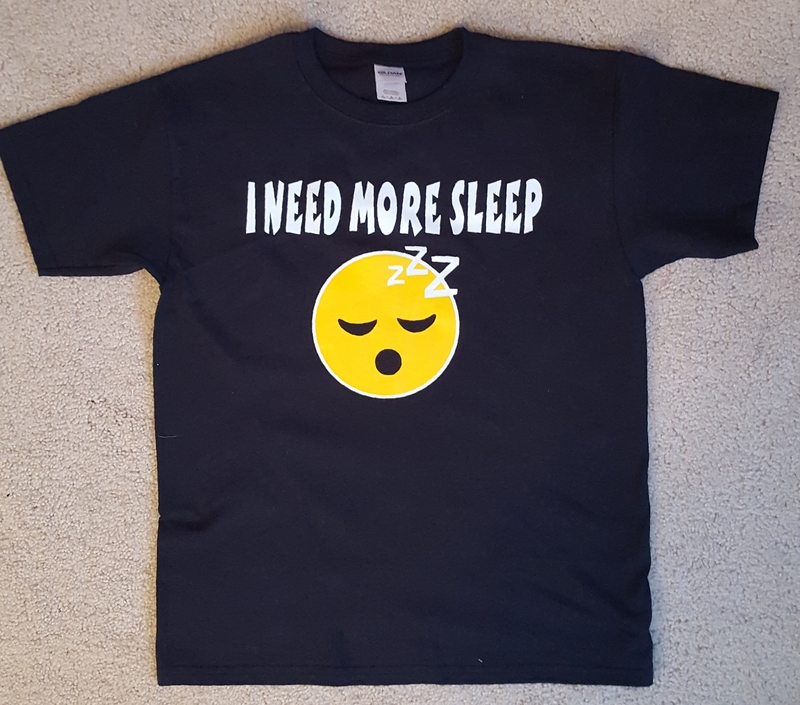 While it’s in the wash, I decided to make a shirt, then I realized how hard it was to find the sleep emoji online. 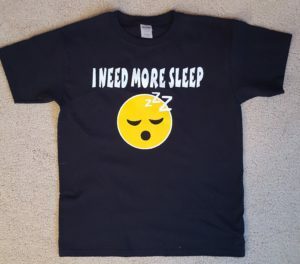 After a search on Etsy, I finally found one – although after purchasing it, was totally disappointed as to how it was designed. Since the face layers couldn’t be separated, I wound up having to cut out part of the white background layer so that I could make the eyes dark while still keeping the “ZZZ” white. Normally it might not be a big deal but the yellow is just translucent enough you can see the cut part behind it. I’m sure no one will notice but me, but I’m still disappointed. At least the white glows and looks cool! This entry was posted in Uncategorized on October 24, 2017 by stacy. This weekend was filled with “secret project” sewing. So while I can’t show you the entire project I’m working on, I can give you a peek. 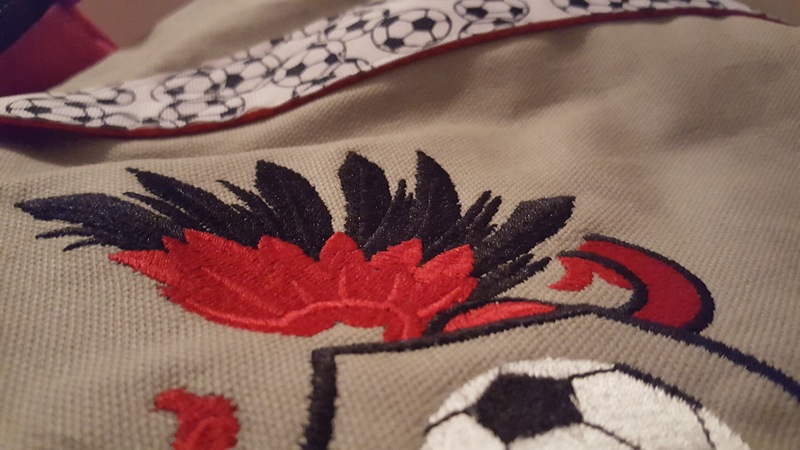 This particular design is Urban Threads Sporty Soccer Crest. I love it for it’s bold hues, which oddly enough, are very similar to Easton’s own club colors. It stitched out beautifully which makes me love it even more! On today’s agenda…. tracing a few patterns. Bleh. This entry was posted in Uncategorized on October 23, 2017 by stacy. 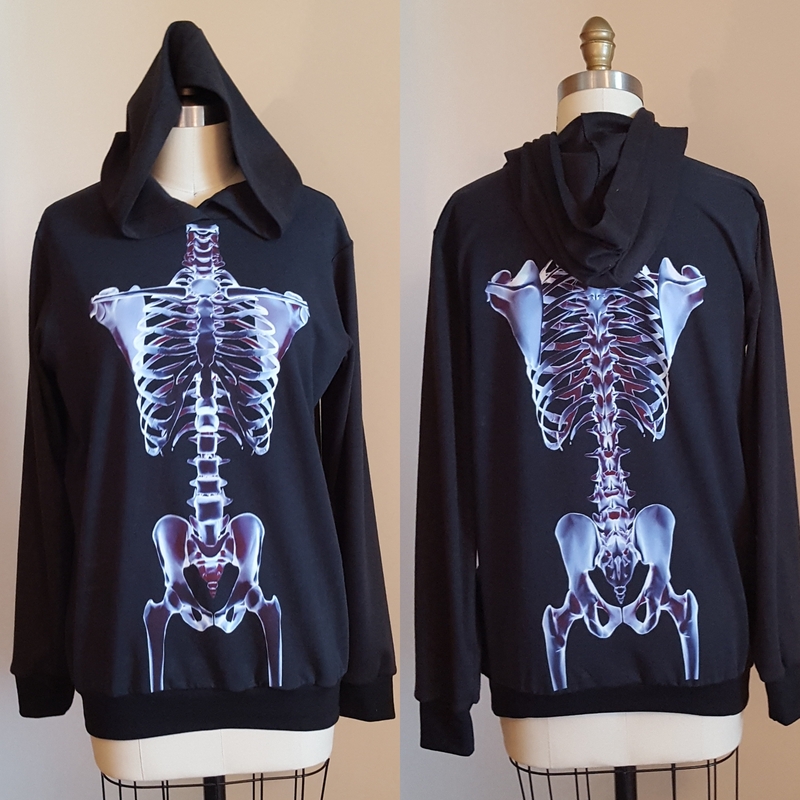 I went back to my pile of cut projects and pulled out what I thought would be a great hoodie for Halloween… Dem Bones. I had originally purchased this panel because it was so fun that I couldn’t resist and then decided that it would make a great concert going top, but never found the time to sew it up…. so it sat for a year or so before I decided to resurrect it. 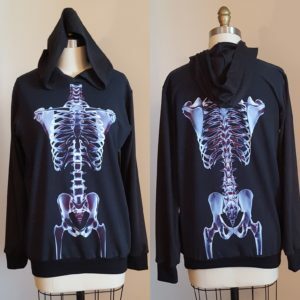 I had originally cut the arms, hood, and banding from the same black material as what I used for the body of this raglan, but decided that it was not only a huge shade difference between the panel and the rest of the hoodie, but that the material itself was too thick and stiff for it to be comfortable. I wound up buying a black cotton from Joann’s that was a much closer match – I think that it blends nicely overall. As for the pattern, I used Jalie 3355. This was the first time that I had added a hood, but sewing this up wasn’t much different so everything came together very well. The fit is slightly looser than other sweatshirts that I’ve made mostly because the fabric on this one was a cotton lycra and just not as bulky. Now I’m waiting for it to cool down enough for me to wear this – what a warm fall we’ve had! 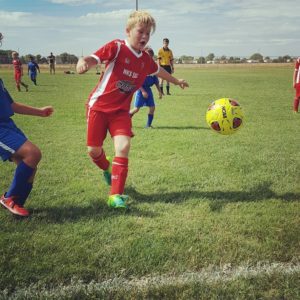 This entry was posted in Uncategorized on October 20, 2017 by stacy. Need a quick costume, but don’t really want to wear a “costume”? Then be sure to check out this Gone Batty Top! This fun little circle top is great for something quick to thrown on and still look holiday stylish. Don’t forget to download the instructions here. Need a hat to go with that circle top? Whip up an easy Witch Hat, too! Fall is here which means it’s scarf season. Learn how to make a beautiful, extra long, crinkle gauze version embellished with sparkles and tassels. This double sided fringed scarf is pretty spectacular too. Forget poodle skirts this Halloween, make it a unicorn instead. Couldn’t everyone use a bit more light when they sew? Now you can win an LED kit that attaches to your machine. Beat the chill and make yourself a new hoodie. If you haven’t tried reverse applique yet, this deer head pillow tutorial is a great place to try this technique out (plus you make a cute new pillow in the process). This cape is perfect for Halloween or for a child who loves to be a superhero every day. Tired of Halloween? Get a jump start on Christmas and stitch yourself up some new ornaments like this cute felt camera or this easy rainbow snowcone. This entry was posted in Uncategorized on October 19, 2017 by stacy. I’m not normally a fan of Joann’s Doodles line for fabrics. While the prints are adorable, the material itself doesn’t (usually) have great stretch and recovery. 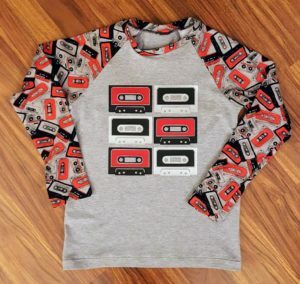 However when I saw the Cassette Tape print, I caved. 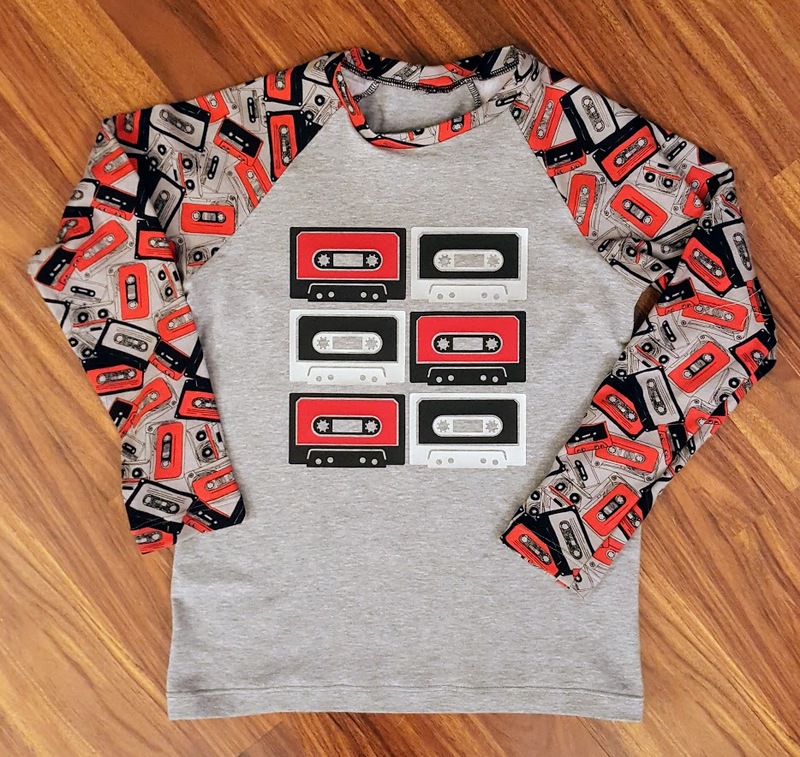 I had just stumbled across a retro cassette tape project from Cricut and I decided that I wanted to make a shirt using both elements. I wound up using Jalie’sNico pattern again, but this time went with long sleeves so we can start having “cooler weather shirts” to wear this winter. The vinyl is changed slightly from the project directions so that it matched the cassette tapes on the fabric better. Instead of going with gray, I opted for silver which shows up better on the shirt (but not so well in photos). Overall, I’m in love with this one – let’s hope Easton feels the same way! This entry was posted in Uncategorized on October 17, 2017 by stacy. 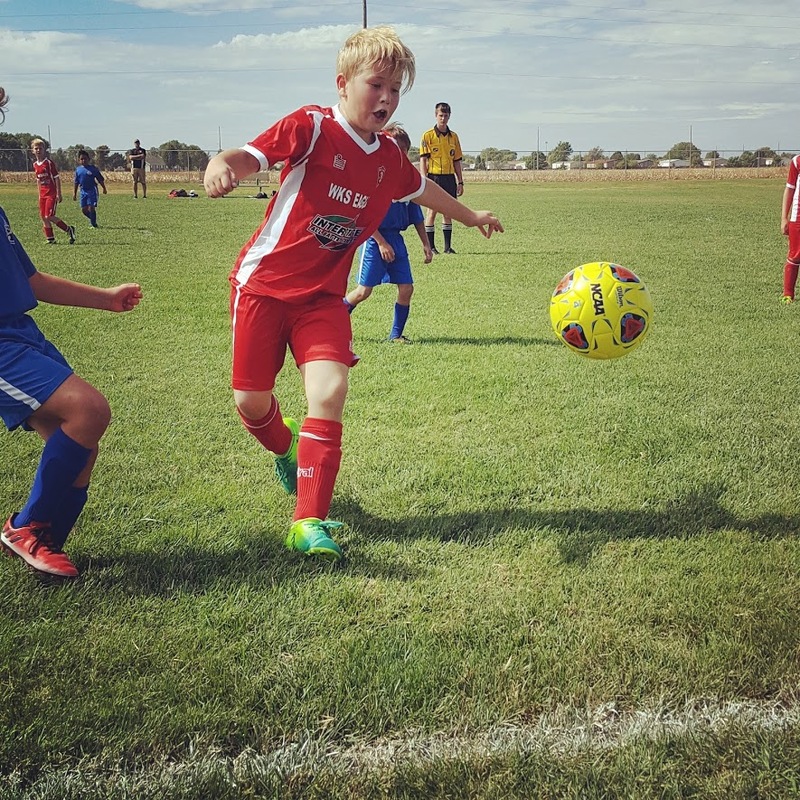 Between being sick and a weekend soccer tournament, I got nothing accomplished. I had started a new Nico on Friday, but still have the hems and an vinyl image to place on the front before I consider it “finished”…. I’m still waffling on what I want to do with it, though. Meanwhile, today it’s time to get back on track with projects – some “behind the scenes sewing” that I can’t share yet in addition to everything I have recently cut out. Hopefully I’ll have more to share tomorrow, like a new NIco! This entry was posted in Uncategorized on October 16, 2017 by stacy.